Meredith is celebrating Every Day With Rachael Ray’s 10th anniversary by shaking things up a bit. 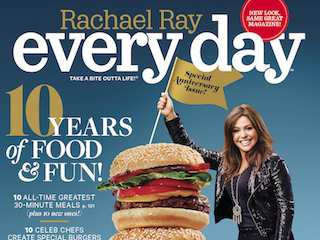 The magazine has a new logo, layout and name — starting with the November issue, it will be Rachael Ray Every Day. While the new name is virtually the same as the old name, publisher Stephen Bollinger described it as “stronger and simpler.” Hey, whatever works. If you’re around on Wednesday, keep an eye out for a Rachael Ray food truck, which will be rolling the streets in celebration of Every Day’s birthday.